As Queen of Mictlan (the underworld), the goddess Mictēcacihuātl rules over the spirits of the afterlife with her husband, Mictlantecuhtli. She was worshipped across Mesoamerica in the cultural belief that instead of going to heaven, all the souls of the dead descend nine layers in an arduous, four year journey into extinction in the deepest part of Mictlan. In Mexico, the idea that souls exist after death is passed down from parent to child. Spirits of the dead rest in Mictlan until awakened from their eternal sleep for one day each year, when they can return home to visit their loved ones. Mictēcacihuātl watches over the bones of the dead and presides over their ancient festivals. The Aztecs recognised death as a natural part of the circle of life. Instead of insulting the dead with mourning or sadness, the lives of the deceased are honoured. This tradition is still continued today in the festival now known as Dia de los Muertos (Day of the Dead), which highlights the very different attitude Mexicans have towards death. It becomes colourful and joyful – a grand celebration of life. On the small island of Janitzio in the Mexican state of Michoacán, the descendants of the Purépecha people maintain the time-honoured customs of their ancestors. The mystical and spiritual rituals, which take place over two days, are a wonder to behold. November 1st is known as Día de los Inocentes (Day of the Innocents) to honour children who rest with Mictēcacihuātl. From 7am, the Kejtzitakua Zapicheri (Wake of the Little Angels) begins as the mothers and siblings of the departed go to the cemetery and lovingly prepare an altar with flowers, wooden toys and sweets .They hold a wake while the fathers watch on from outside the graveyard. The Purepecha Animecha Kejtziatakua (Night of the Dead), when deceased adults are welcomed home, begins at sunset. The fishermen of Janitzio head out on the lake in wooden canoes lit with candles to perform a butterfly dance using their nets as butterfly wings. This is intended to rouse the souls of those who have passed and guide them into the cemetery. 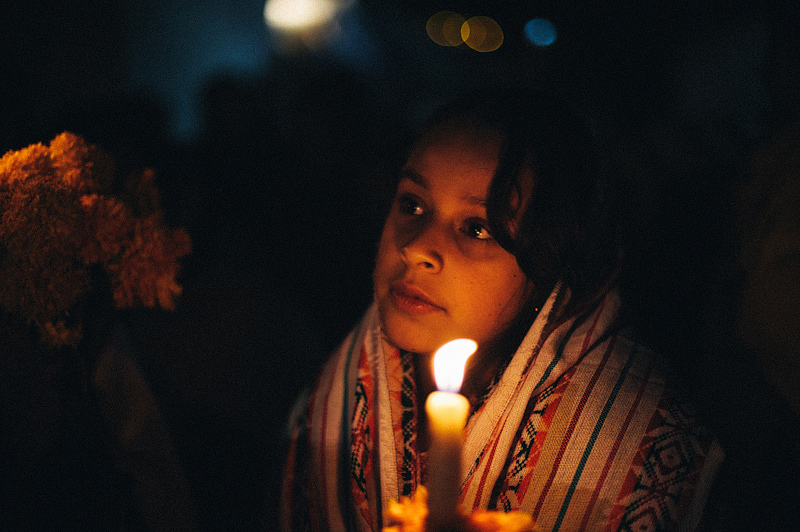 At midnight, when Día de los Muertos (Day of the Dead) begins, women and children take torches and candles and return to the altars which they have lovingly prepared. Fires are lit, copal pom incense is burned, costumes of animal skins and bones are worn. Offerings of ceramics, flowers, food and drink are presented. The cemetery bell tolls all night long, calling out to the dead. Participants say they can feel the wind pick up as spirits are blown back to Earth, drawn by the aroma of marigolds and copal smoke, the promise of celebration and the sugar skull offerings. The women and children chant and pray in Purepecha (their indigenous language), receiving their guests with solemnity. The men wait outside the cemetery until dawn, when the vigil ends and the souls return to Mictlan, under the watchful eye of Mictēcacihuātl.